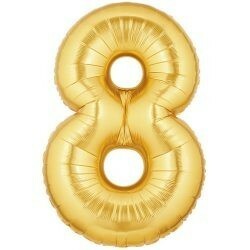 This Large Gold Number 8 balloon is 40"/98cm tall. 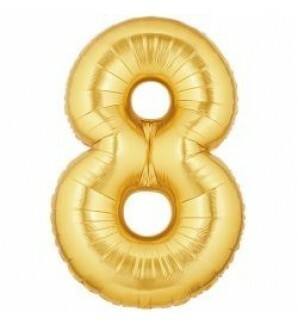 This quality Gold Number 1 Helium balloon is delivered in a very large balloon box lined with tissue paper. Your personal hand written message on a card is attached. Height 24"/61cms All our helium Balloons includes a choice of free chocolates (35g) or kids sweets if from the menu on the right of this screen. You can also choose from a range of Bears / Chocolates / Banners / Badges and many more items from the gift below. You can also add extra gifts to your balloon box from the on the right to make your gift that extra bit special, and why not add extra balloons to make a beautiful balloon bouquet.